Balancing the early stages of a research career, while simultaneously keeping up to date with developments in the field generates some unique requirements for researchers in international development. WOMID is a new global mentoring initiative for women, facilitating mentorship between early career academics and practitioners. Alex Dorgan and Beth Harrison, who co-founded WOMID based on their own experiences of doing PhDs, explain what WOMID is all about and how you can get involved. Women Mentoring in International Development (WOMID) is a new initiative for women (including all those who identify as women) which facilitates mentorship between early career academics and practitioners working in the international development space across the globe. Build a network of women in international development, facilitate a learning hub, and use these as a platform to provide support for members. As of September, WOMID has had registrations from over 70 mentees and over 40 mentors across almost 30 countries including from institutions such as IIED, Womankind Worldwide, Oxfam, CAFOD, Save the Children, the National Centre for Technology Management (Nigeria), University of Colombo (Sri Lanka), Utrecht University (the Netherlands), and Stellenbosh University (South Africa) to name just a selection. Where did the idea for WOMID come from? Earlier this year, over a refreshing post-conference drink (or two), the two of us were discussing how great it had been to connect with some amazing and awe-inspiring women working in the development field. We had been fortunate enough to meet several genuinely lovely, approachable, supportive and inspiring women who were working on related areas of international development to our PhDs, but outside of academia. Having undertaken both fieldwork in our case study countries (Tanzania and Zimbabwe), as well as a UK Economic and Social Research Council (ESRC) funded Overseas Institutional Visit (in Kenya and South Africa), we have both had the opportunity to meet some amazing women working on development issues in these countries, and this was something that we both found highly valuable. Finally, through our social networks – and sometimes at more applied conferences – we met some incredibly supportive and approachable women working in international development based nearer to home. All these women provided us with advice, guidance, reassurance, and an invaluable perspective from outside academia – something that we found particularly helpful both personally, and professionally. 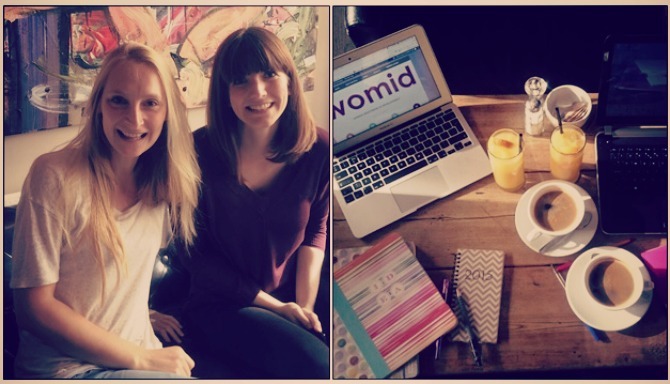 WOMID’s co-founders, Beth and Alex; and WOMID planning in London. One of the most rewarding things we’ve found about talking with these women, is not just that they are supportive, inspirational and lovely people, but also that they are genuinely interested in hearing about our research and can often offer a completely different perspective on it. And of course, it has been great for our career opportunities! We thought it was important that other early career academic women realised how much support is out there for them as well and thought of providing a structured means for this to happen. We had both also been part of a conference organised by the Researchers in Development Network (RiDNet) at the University of Leeds earlier in the academic year. The conference focused on whether research makes a difference in development and how to bridge the gaps between research, policy, and practice. 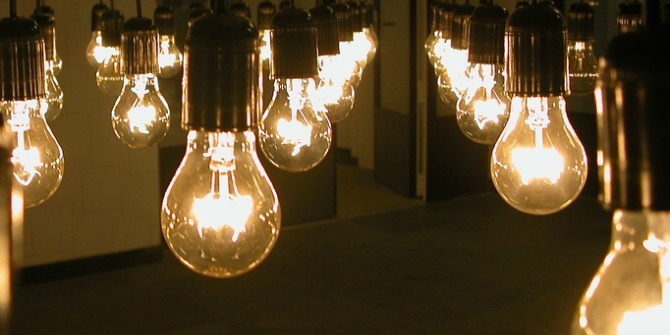 One of the solutions discussed was to increase the communication between researchers and practitioners/policy makers (read about the 5 recommendations to emerge from the conference as another of LSE Impact Blog’s posts here). We realised that a mentoring scheme that directly connects a new generation of researchers to those working in development practice would be a start in creating these relationships, and could offer a relatively simple and effective way to provide networking and mentoring opportunities to other early career researchers. We did some brainstorming, and WOMID was born. It was therefore our own experiences of developing valuable relationships with inspiring women working in development – but a lack of a more formal and structured pathways to do so – that prompted us to set up WOMID. The initial response we have received to WOMID since sharing it with our own networks has demonstrated a real demand for an initiative like this. What is WOMID trying to achieve? WOMID consists of four key elements: mentoring, bridging, networking and sharing. Mentoring has a widely varied interpretation depending on the situation and context. At WOMID, mentoring refers simply to a more experienced or knowledgeable person providing guidance and personal or professional development to a less experienced or knowledgeable person in an area of expertise. In the case of WOMID, the ‘area of expertise’ is experience working in international development, whether in practice on the ground, through policy development, or research. More experienced professionals provide mentoring for early career academics such as PhDs and post-doctoral researchers (and eventually, early career practitioners too). The early stage of an academic career comes with the challenges related to immersion in academic debates surrounding specific international development topics, while often simultaneously working on the ground with development programmes and/or with people involved in development issues. Grappling between these two worlds generates some unique requirements, and we believe that learning from the life and professional experiences of those who have a higher vantage point in the development field can provide a grounding and supportive environment, and help meet these requirements. build potential for future collaboration. We also envisage that the mentor/mentee designation will evolve over time into a reciprocal learning relationship, and may in many cases become more ‘mentor-to-mentor’. It is increasingly acknowledged that there is a gap in communication and information sharing between academia and international development practice, and that in order to create lasting and effective solutions to many of the world’s problems, the two areas need to align and work more closely together (for a more detailed discussion on this, see a previous LSE Impact Blog here). WOMID has been developed with this challenge in mind and hopes to help bridge this gap by linking academics and practitioners in order to learn and share from each other, and to build a hub through which this two way exchange can continue and grow beyond the formal mentoring process. In addition, the international aspect of WOMID provides south-south and south-north partnerships that are still, in our experience, relatively lacking in international development. We hope that WOMID will also help to bridge cross-cultural exchange, create transnational opportunities, and challenge perceived wisdoms on the direction of knowledge and power flows in international development. A central online forum and both online and offline events will create a supportive and professional network for all involved in WOMID. The forum will be accessible to all members to use for discussions, questions, and the sharing of opportunities. Events will be organised for group discussions, regional hubs around sectors or geographical foci, as well as informal social events. These will provide opportunities for all WOMID members to get to know each other outside of the mentoring pairing and to build lasting relationships. We strongly believe that there is a real need for women working in international development to have a friendly space for networking and socialising opportunities, which will allow them to develop supportive and useful connections, boost self-confidence in professional contexts, and learn from each other. Through a widely accessible and active blog, WOMID will provide a space for sharing research findings, professional experiences, and reflections on international development as well as the WOMID mentoring experience itself. There will be regular posts from mentors and mentees across the world active in all sectors of international development and all stages of their careers, along with more targeted pieces on topical international development issues, and more exploratory posts driven by WOMID member-submitted questions. Through all of the above, WOMID will share experiences and reflections across sectors and cultures, experiences and networks. By sharing the publicly-accessible blog on social media outlets, WOMID will also be reaching non-members and others in the international development field. International development is still a male dominated field especially in positions of leadership and power, and especially in developing countries. We are not aware of any comprehensive studies that assess this for the international development sector specifically (if anyone knows of any, please do link them in the comments below), so we looked into basic employment gender statistics for some high-profile international development organisations: incl. DFID, Oxfam, UNDP. Broadly, while the overall share of employment appears to be fairly evenly spread, the middle-management and senior positions tended to be male-dominated (see e.g. UNDP Gender Equality Strategy p.19 and DFID Diversity and Inclusion p.20), and issues such as sexual discrimination and harassment are often reported. See for example this case. WOMID is committed to supporting women in changing this status quo By demonstrating that the disadvantages women face across the globe are not inevitable, WOMID’s women-to-women network rejects the status quo; WOMID responds to the challenges encountered by female early career academics and practitioners trying to work in development, and offers a way in which these challenges can be overcome. .
Women face a significantly higher number of considerations when working in international development, especially when working abroad in different cultures (Desai and Potter, 2006). These include (but are in no way limited to): safety, familial responsibilities, cultural sensitivities towards dress sense, the role of women in local societies, and other restrictions within patriarchal societies. We believe that having a platform to discuss these issues amongst other women facing them will be a valuable addition to the community. From speaking to many female colleagues, confidence issues are highly prevalent amongst women in international development and especially in early career academics. This affects a number of professional attributes and activities including, crucially, networking and ‘leaning in’. This is exacerbated by activities such as the perception of networking as unfeminine and frequently dominated by more powerful and confident men (see Sheryl Sandberg’s TEDx talk for further detail on this topic). Given the unique challenges and considerations that women face, we believe learning from other women’s personal and professional experiences in these areas is a brilliant current strategy for addressing these issues. We appreciate that men could equally benefit from a similar initiative. As WOMID is a young organisation, we are open to suggestions and collaborations on how this could be taken forward, including the possibility of expanding beyond the initial plan outlined here. Any male PhD students or post-doctoral researchers reading this who think they would benefit from a similar initiative, please get in touch! We do not intended to be a closed organisation and are actively looking at ways to ensure we feed our discussions back into the wider international development community. What are our hopes for WOMID in the future? Women from all over the world have signed up – but we’d like more! Sign up here. We’re planning an online launch event or ‘hangout’ for everyone to meet, as well as more networking opportunities in the near future. We are applying to become a Charitable Incorporated Organisation with the UK Charity Commission and once established will be looking into funding sources for our growth and to further support our members. 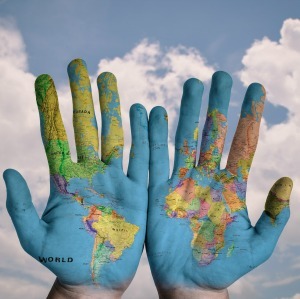 Eventually, we’d love to be able to have regional and sectoral “hubs” connecting practitioners and early career academics working on similar topics or regions, as well as a continued global presence. Evolve to provide support for ‘early career women working in development’ (both ‘practitioners’ and academics) from more experienced ones. Interested in becoming a mentor or mentee? You can find out more about what this involves on our website. Please register your interest by October 30th. Any questions, you can contact us through our website, email us at thewomidteam@gmail.com, find us on Facebook, or follow us on Twitter or Instagram. We are also open to suggestions and advice on how we could improve our current approach so if you have any thoughts, please do share via any of the contact options above…We look forward to embarking on this journey together with you! We are grateful to Padmini Iyer who was immensely helpful in developing and writing the discussion around ‘why women?’, and is generally a brilliant source of support and wisdom. Thank you also to all those who kindly reviewed the post. Alex Dorgan is a final-year PhD researcher at the School of Geography, University of Sheffield and the University of York, where she works on climate compatible development in East Africa. Alex’s thesis examines the impacts of private-sector investment in carbon forestry and agriculture in Tanzania on local communities’ livelihoods, ecosystem services, and environmental knowledges. Alex tweets @alexdorgan about all things climate & development, feminism, politics, and things that make her smile. Beth Harrison is a final year PhD student at the Sustainability Research Institute, University of Leeds and is researching the multi-level governance complexities of community-based natural resource management in Zimbabwe with a central focus on the role of local stakeholders in the management and conservation of key natural resources. Elizabeth’s thesis aims to ultimately shed light on the wider institutional processes affecting natural resource management impacts and in doing so provide recommendations for the design and implementation of new community-based natural resource management type projects in sub-Saharan Africa. Elizabeth tweets @EPHarrison and blogs here. I can’t think of any studies specifically focusing on women in international development. I think there are a few on women in international relations (diplomacy) and women in peacebuilding operations. And yes, I can also see the value of a mentor programme specifically for women. There are challenges that are specific to women, and apart from the ones mentioned in the blog post there will be others that have overlap with normal public / private sector jobs outside of the international development sphere. A pity is that there still seems to be a tendency to find women is categories of profession that are typically seen as female. The number of female engineers and logisticians are limited, and not necessarily because they have limited access to the jobs, but for a good part because there just aren’t as many. But you will find scores of female doctors and nurses. I can only hope that more women will make early career choices in professions that are currently seen as male. Also, you talk about “…frequently dominated by more powerful and confident men.” Let’s be clear that apart from these men, there are also other men who at times have equal feelings of discomfort around such ‘powerful’ (read; loud and obtrusive) and confident (read; overcompensating and stuck in their ideas) men. I have worked in international development for a while now and I’m pretty tired myself with these powerful and confident men who often have little to contribute in comparison to their loudness. A final point is towards engaging men in gender issues. We talk about it a lot. But in the end, this mentoring program seems to be exclusively by women, for women. I can completely see the ‘for women’ element, and I can understand that women mentors will probably have a better understanding as to the challenges women face in international development. But wouldn’t it be neat if gender-sensitive men – like myself – would also have the opportunity to mentor? I might not have experienced the challenges female mentors might have experienced, but involving men might actually help in finding solutions to these issues.